Beginning in mid-June, Arizona State University will host 50 of Africa’s brightest emerging leaders for six-week academic and leadership institutes sponsored by the U.S. Department of State. The Mandela Washington Fellowship, the flagship program of President Obama’s Young African Leaders Initiative (YALI), empowers young African leaders through academic coursework, leadership training, mentoring, networking, professional opportunities, and support for activities in their communities. Fellows are young leaders from Sub-Saharan Africa who have established records of accomplishment in promoting innovation and positive change in their organizations, institutions, communities, and countries. ASU has been a host institution for the program since its inception in 2014. Led by the College of Public Service and Community Solutions, two cohorts of Fellows—one in Civic Leadership and one in Public Management—will come to Arizona as part of a larger group of 1,000 Mandela Washington Fellows hosted at institutions across the United States this summer. The highly competitive program attracted more than 40,000 applications. “We are excited to expand the program this year with two cohorts. Each year has been inspiring, and we truly learn as much from the fellows as they do from us,” says Jonathan Koppell, dean of the College of Public Service and Community Solutions. Working closely with the U.S. Department of State’s Bureau of Educational Affairs and its implementing partner, IREX, host institutions have designed academic programs that will challenge and empower these inspiring young leaders from Africa. “Our college has diverse, cross-sector expertise in civic leadership, social entrepreneurship, public policy and urban management. Coupled with our strong community partnerships, we are creating connections that will result in collaborative solutions,” Koppell added. Fellows will meet with faculty from across the university, as well as community advocates and practitioners. The College has partnered with dozens of institutions across Arizona to provide this group a comprehensive experience: City of Phoenix, Local First Arizona, International Rescue Committee, the Hopi tribal community, Grand Canyon Trust, Terra BIRDS, City of Tucson, City of Flagstaff, National Parks Service, and more. 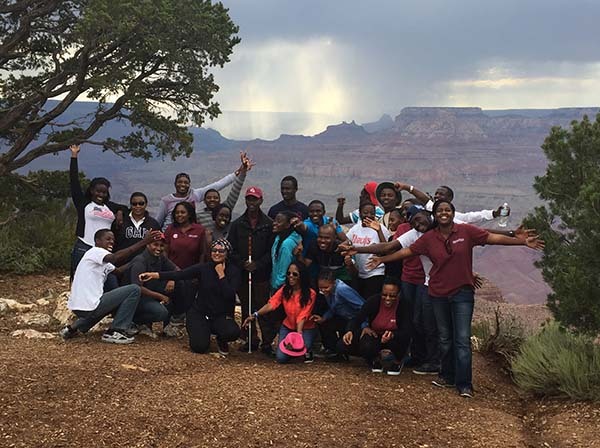 As part of the institute, Fellows will travel to Flagstaff, Tucson and Sedona, visiting landmarks such as the Grand Canyon and Kartchner Caverns. They will work on community service projects, visit with elected officials, local agencies and nonprofits. At the end of the institutes, all of the Fellows will gather in Washington, D.C. for a Presidential Summit; select Fellows will also spend six weeks in professional development training with U.S. non-governmental organizations, private companies and government agencies.